They have a snap in socket for the phone, and have a storage area behind the phone for your cards or money. 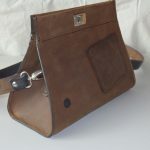 The left side features a pocket and flap that can be used to store: a key, credit card, business card, money, etc. The book is available in a variety of high quality leathers, and is hand sewn with a saddle stitch. The edges are burnished with Canadian bees wax. Sharpen your L’Indispensable Knife, the easy way!